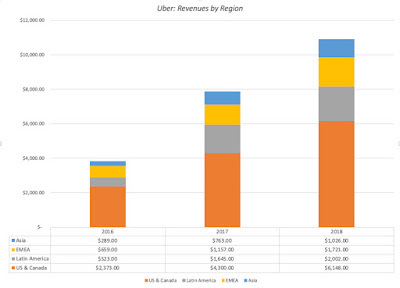 Musings on Markets: Uber's Coming out Party: Personal Mobility Pioneer or Car Service on Steroids? 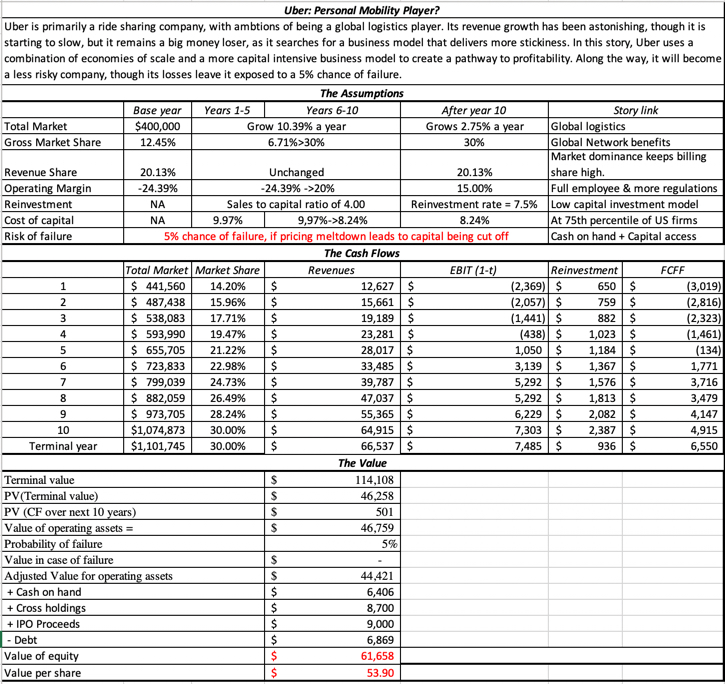 After Lyft’s IPO on March 29, 2019, it was only a matter of time before Uber threw its hat in the public market ring, and on Friday, April 12, 2019, the company filed its prospectus. It is the first time that this company, which has been in the news more frequently in the last few years than almost any publicly traded company, has opened its books for investors, journalists and curiosity seekers. As someone who has valued Uber with the tidbits of information that have hitherto been available about the company, mostly leaked and unofficial, I was interested in seeing how much my perspective would change, when confronted with a fuller accounting of its performance. The adjusted EBITDA column contains numbers estimated and reported for the company, with a list of adjustments they made to even bigger losses to arrive at the reported values. I convert this adjusted EBITDA to an operating income (loss) by first netting out depreciation and amortization (for obvious reasons) and then reversing the company’s attempt to add back stock based compensation. The company is clearly a money loser, but if there is anything positive that can be extracted from this table, it is that the losses are decreasing as a percent of sales, over time. The good news is that the expenses associated with servicing existing users has been decreasing, as a percent of revenues, indicating that not all of these costs are variable or at least directly linked to more rider usage. Also, corporate expenses are showing evidence of economies of scale, decreasing as a percent of revenues. The bad new is that the cost of acquiring new users has been increasing, at least over this time period, suggesting that the ride sharing market is maturing or that competition is picking up for riders. 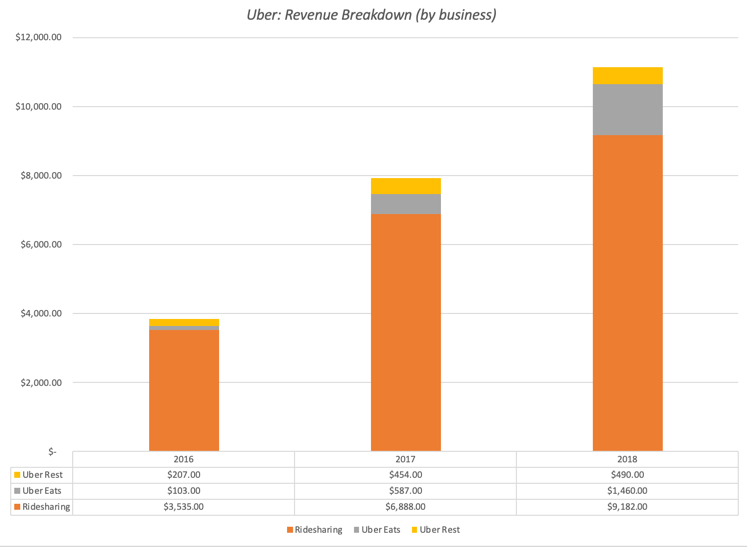 While it is clear that Uber's ride sharing customers have been quick to adopt Uber Eats, there are subtle differences in the economics of the two businesses that will play out in future profitability, especially if Uber Eats continues to grow at a disproportionate rate. 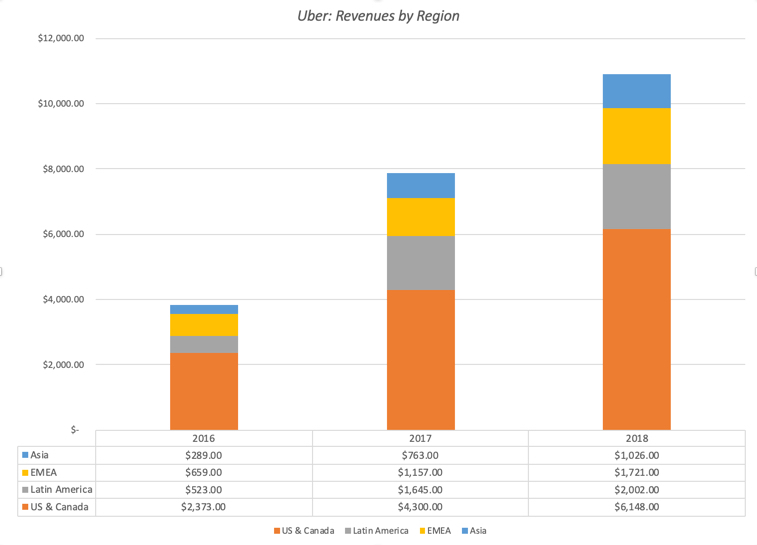 Uber does not provide a breakdown of profitability by geographical region, but the magnitude of the losses that they wrote off when they closed their Chinese and South East Asian operations suggests that the US remains their most lucrative ride sharing market, in terms of profitability. This approach yields a value for the equity of about $58.6 billion for Uber’s equity, which again depending on the share count would translate into a share price of $51/share. Put simply, I hope Dara Khoshrowshahi means it when he says that Uber has to show a pathway to profitability, but I think that is what is more critical is that he acts on those words. 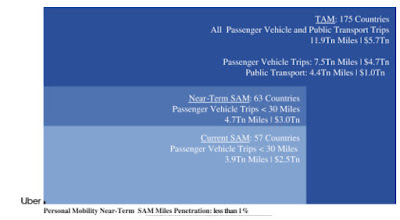 In my view, this remains a business, whether you define it to be ride sharing, transportation services or personal mobility, without a business model that can generate sustained profits, precisely because the existing model was designed to deliver exponential growth and little else, and Uber, and the other players in this game), have only a limited window to fix it. I am sure that there are many who understand the ride sharing business much better than I do, and see obvious limitations and pitfalls in my valuations of both Uber and Lyft. In fact, I have been wrong before on Uber, as Bill Gurley (who knows more about Uber than I ever will) publicly pointed out, and I am sure that I will be wrong again. I hope that even if you disagree with me on my numbers, the spreadsheets that are linked are flexible enough for you to take your stories about these companies to arrive at your value judgments. We derive our revenue principally from service fees paid by our Driver and restaurant partners for the use of our platform in connection with our Ridesharing products and Uber Eats offering provided by our partners to end-users. Our sole performance obligation in the transaction is to connect partners with end-users to facilitate the completion of a successful Ridesharing trip or Uber Eats meal delivery. Because end-users access our platform for free and we have no performance obligation to end-users, end-users are not our customers. 1. Earn more per driver - By charging bigger commissions which requires pricing power which they don't have because of lack of driver stickiness or by charging more from users which again requires pricing power. Or last option is introduction of owned self driving cars where they get to keep all of the ride money. Lyft made a similar point in their S-1 too. So, I think per driver metric is the best one to use for ride sharing companies.